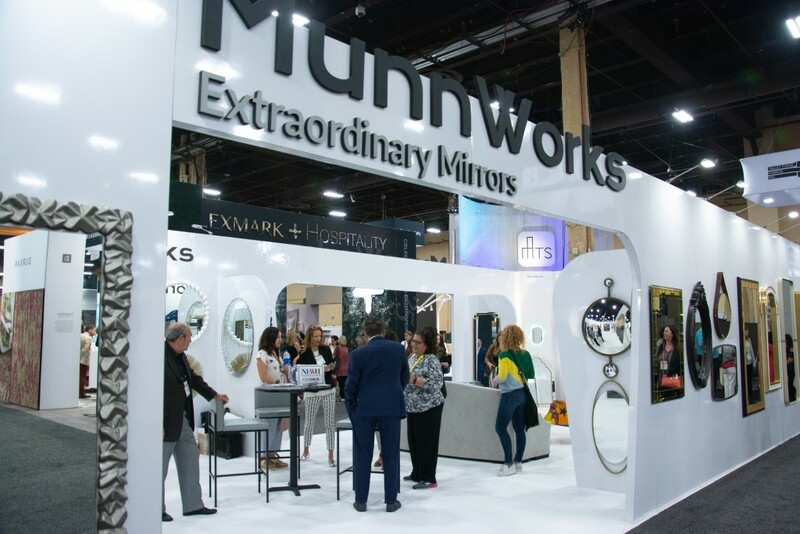 Every May HD Expo rolls into my hometown of Las Vegas. 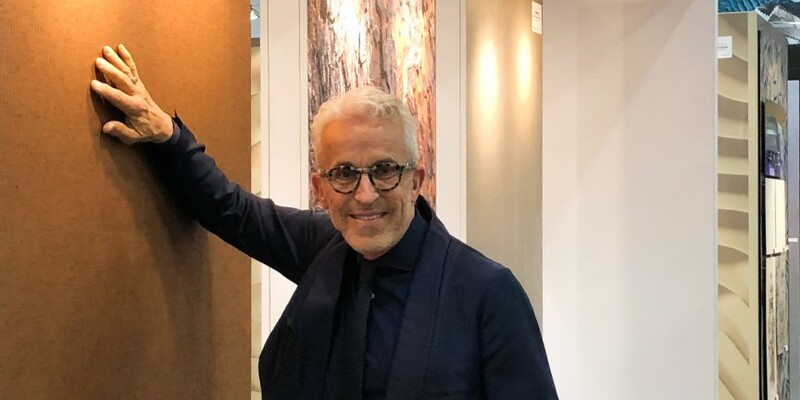 It’s always a welcome chance to take the pulse of the hospitality design business, see what’s new from my favorite industry collaborators and catch up with many wonderful friends. This year’s mood was upbeat, reflecting global lodging demand growth that is driving a 9% jump in projects this year by one count. I also am of course proud to see my own latest works featured by The Roger Thomas Collection partners. 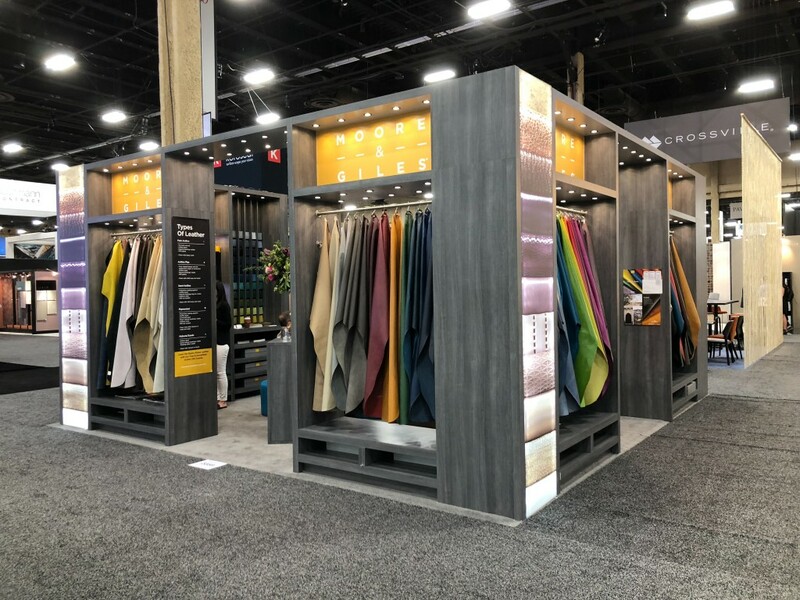 My latest wall coverings – featuring some of my most evocative names yet, “Barking Mad” and “Silk Mirage” – offer yet more demonstrations of how Koroseal’s materials wizardry creates rich textures that offer luxury but also practicality and durability. 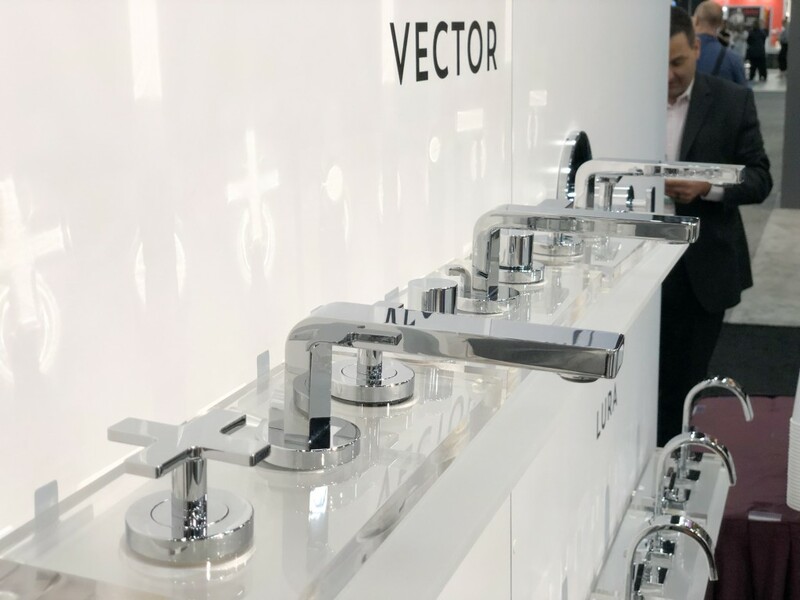 Across the floor, it was equally pleasing to drop by Speakman and see my second collection of bath hardware, Vector, shining splendidly alongside my earlier offerings, the more classical Opera line. 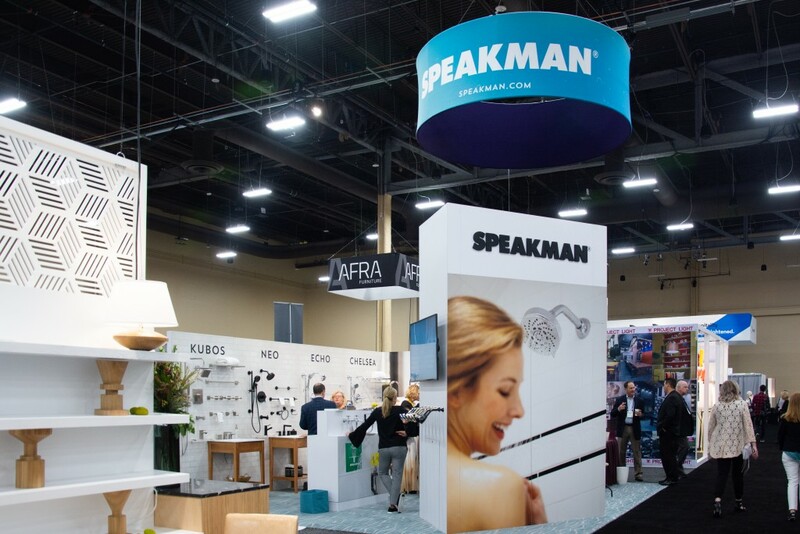 I am lucky to be working with a manufacturer of this quality and am delighted by Speakman’s marketing energy and style. 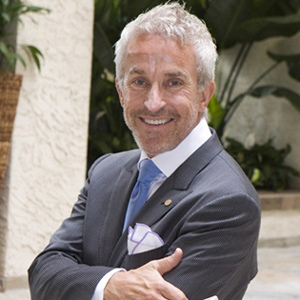 I admire the entire range of elegant offerings these talented companies offer – but forgive me if I’m just a little bit more partial to the offerings that I’ve developed working with these organizations over the years. The entire show was, as ever, an excellent source of ideas and inspiration. 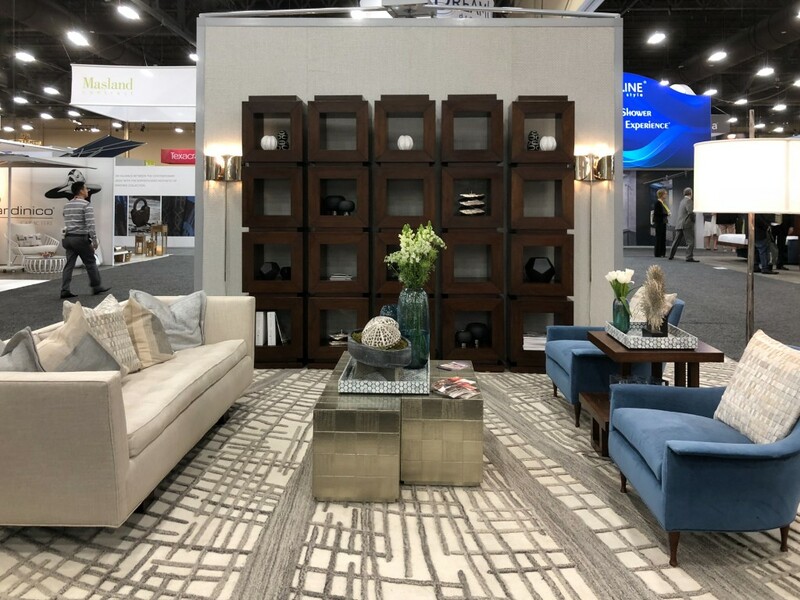 My own list of “must-sees” included mirrors from Munnworks, hardware from Rocky Mountain Hardware, leathers from Moore and Giles and Townsend, furnishings from Walters and home accessories from Studio|A Home. I admire all the elegant offerings of these exceptional companies – but please forgive me if I’m just a little bit more partial to those we’ve developed together over the years. 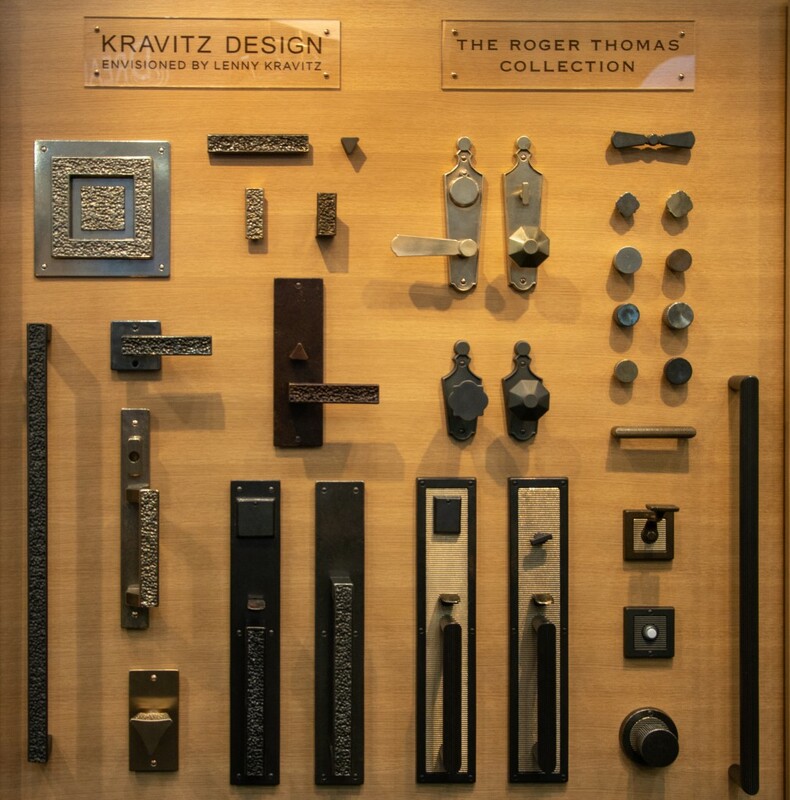 It’s encouraging to see the continuing appeal of these products, offering me real assurance that timelessness is much more than a marketing claim! 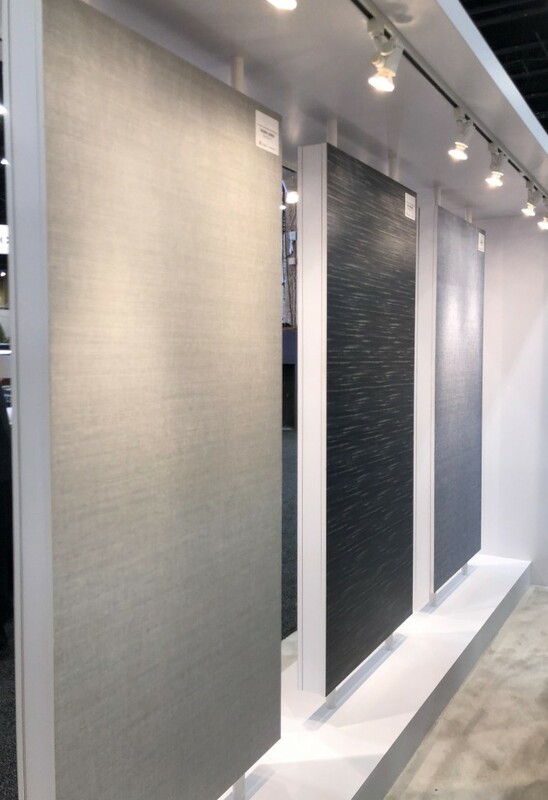 Pleased to see visitors (right) touching my new wall covering collection, “Barking Mad,” from Koroseal booth – touching is the best way to appreciate the luxurious yet practical effect of Koroseal’s materials mastery. 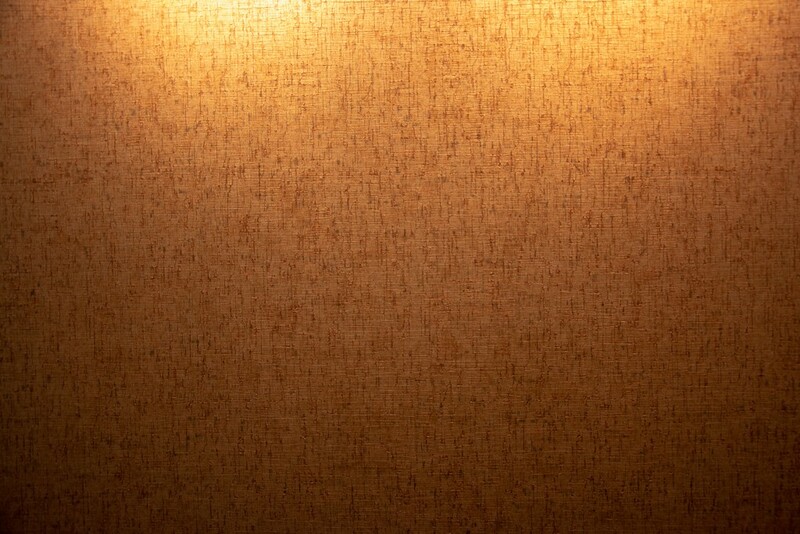 Details of my new wallcovering “Barking Mad” at Koroseal booth. 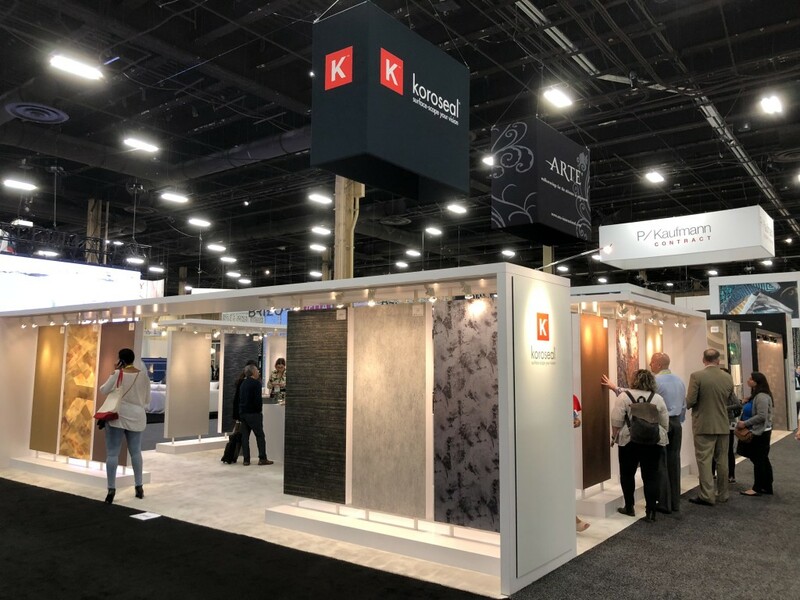 My new wallcovering “Silk Mirage” at Koroseal booth (middle). 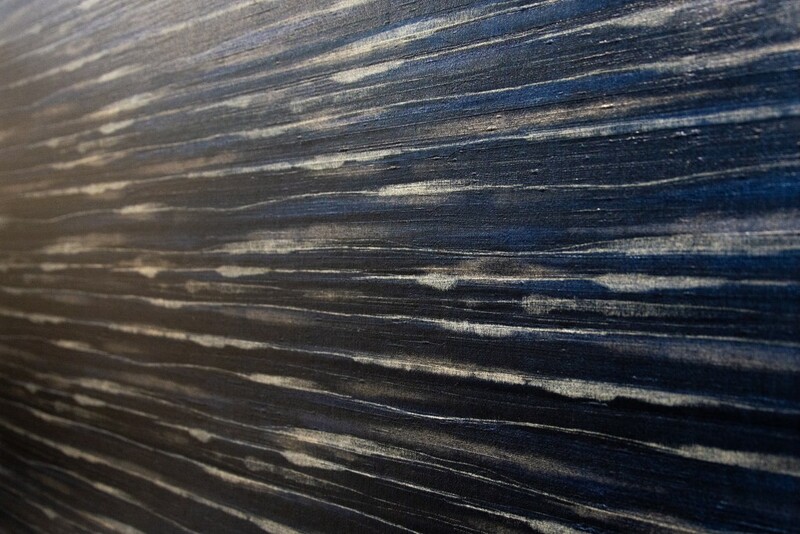 Details of my new wallcovering “Silk Mirage” manufactured by Koroseal. 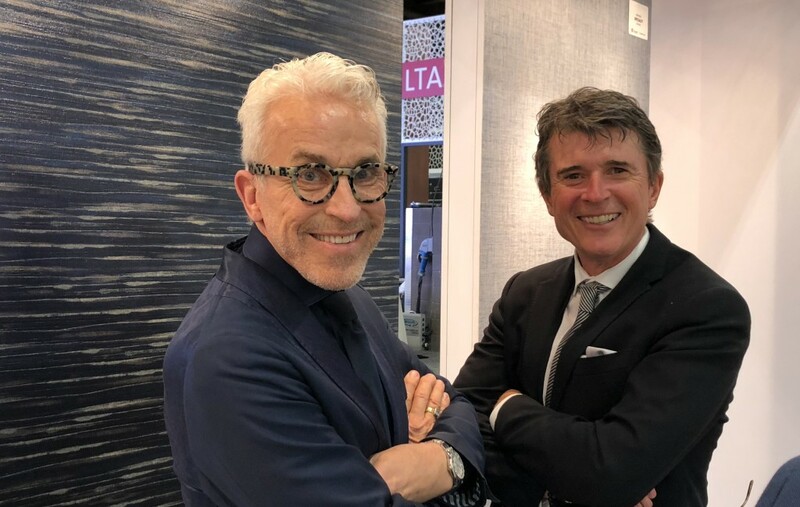 In front of my new wallcovering “Silk Mirage” with Craig McCombe, Koroseal‘s Las Vegas Account Executive. 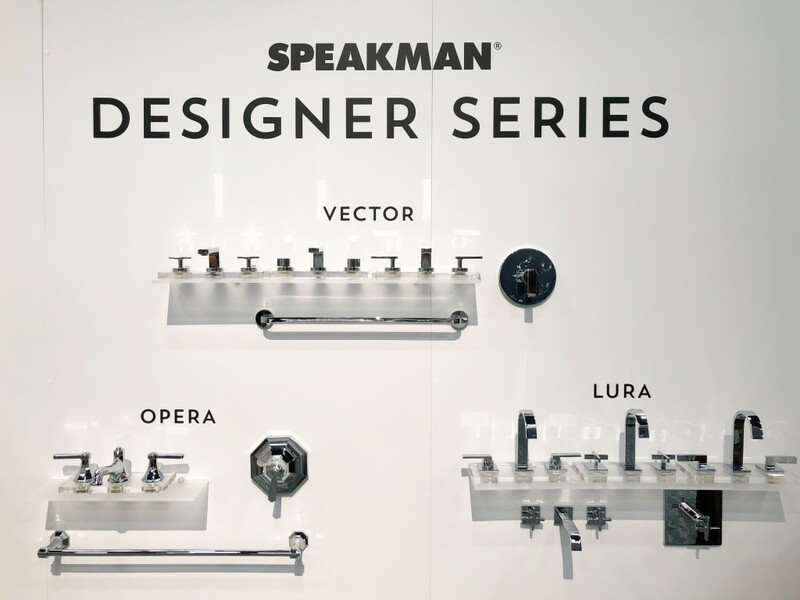 Speakman’s new designer series. I designed the “Vector” and “Opera” collections. The other one, “Lura” was designed by Clodagh. 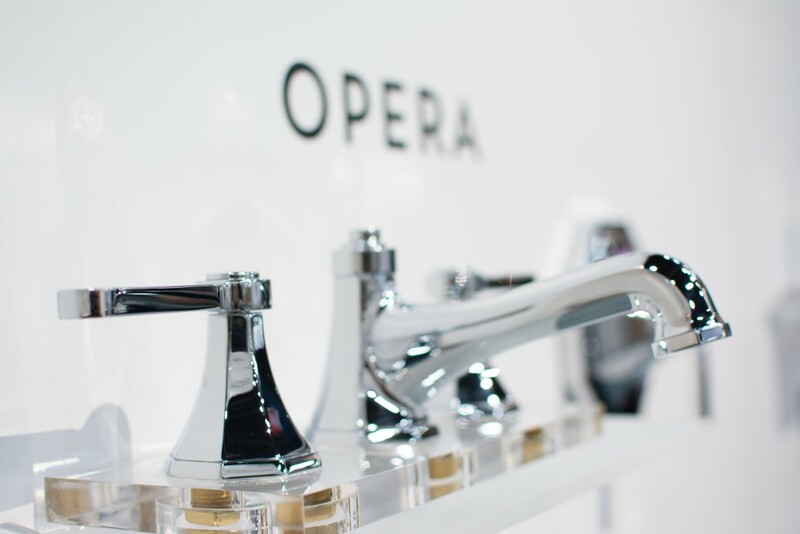 My “Opera” bathroom collection in detail. Shower valve and trim from my “Opera” bathroom collection. 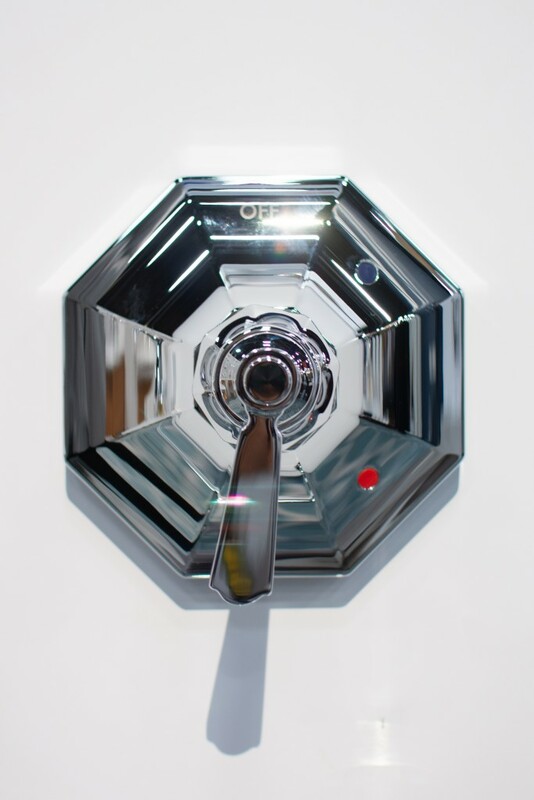 Close-up look at my new “Vector” bathroom collection manufactured by Speakman. 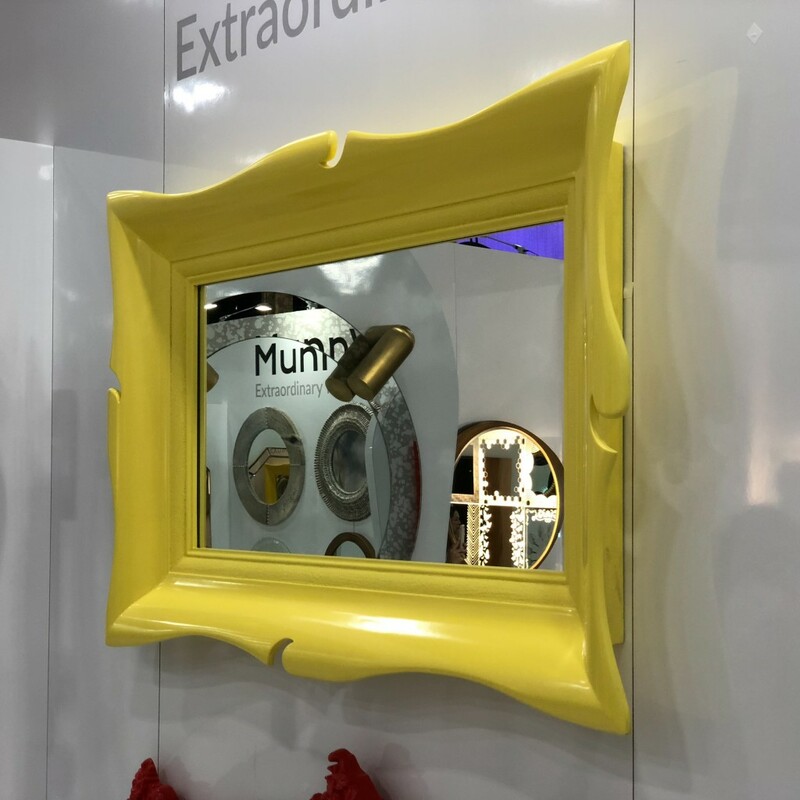 My “Bernini” mirror – in yellow – at Munnworks booth. 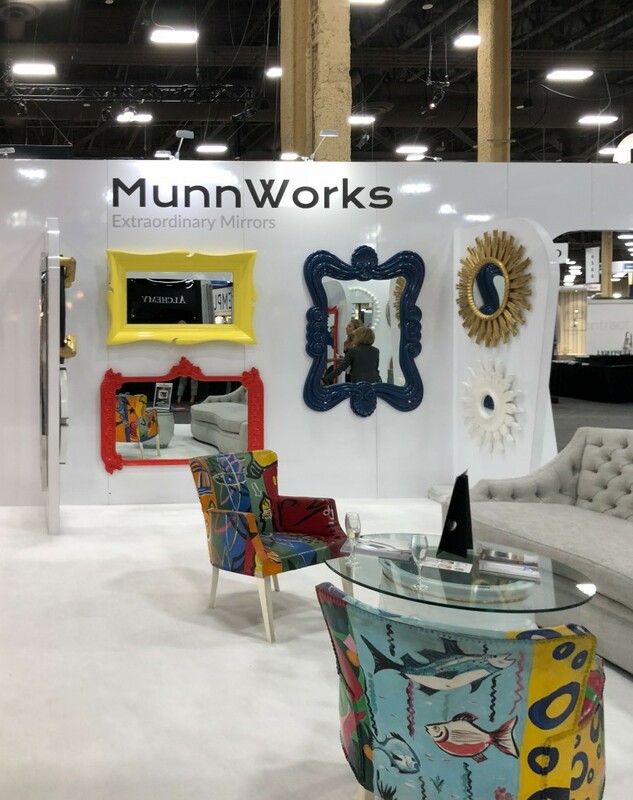 Closeup of my “Bernini” mirror at Munnworks booth. 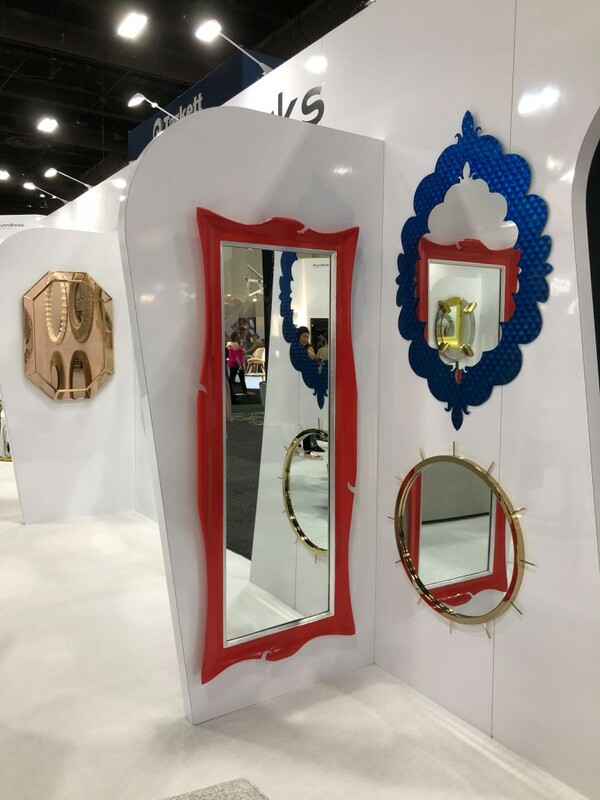 “Bernini” mirror in a different size and color. 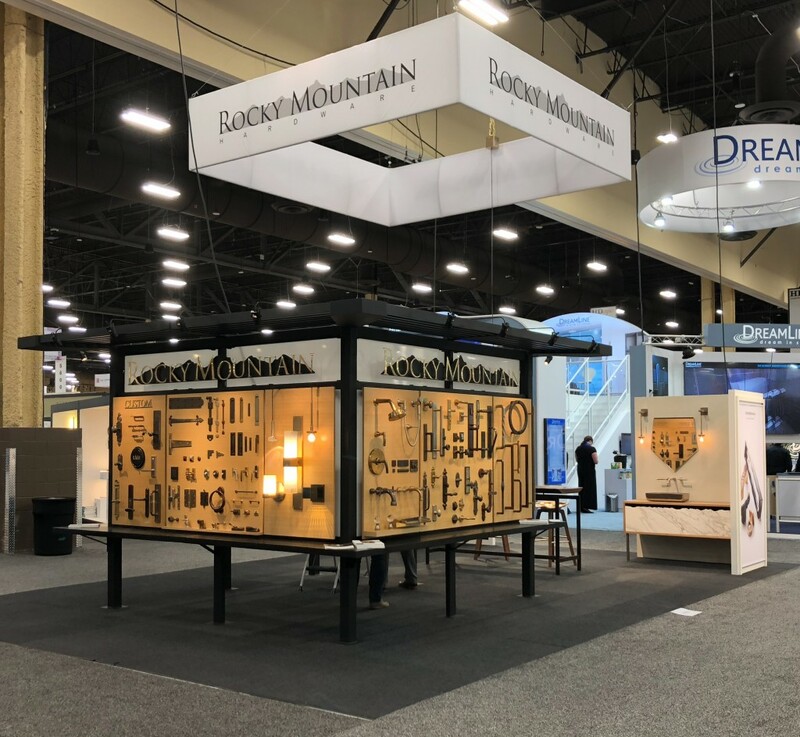 The Rocky Mountain Hardware booth. My work keeps good company at Rocky Mountain Hardware! The luxurious offerings from the masters at Moore & Giles. Three of my designs hang among the luscious offerings from Moore & Giles. 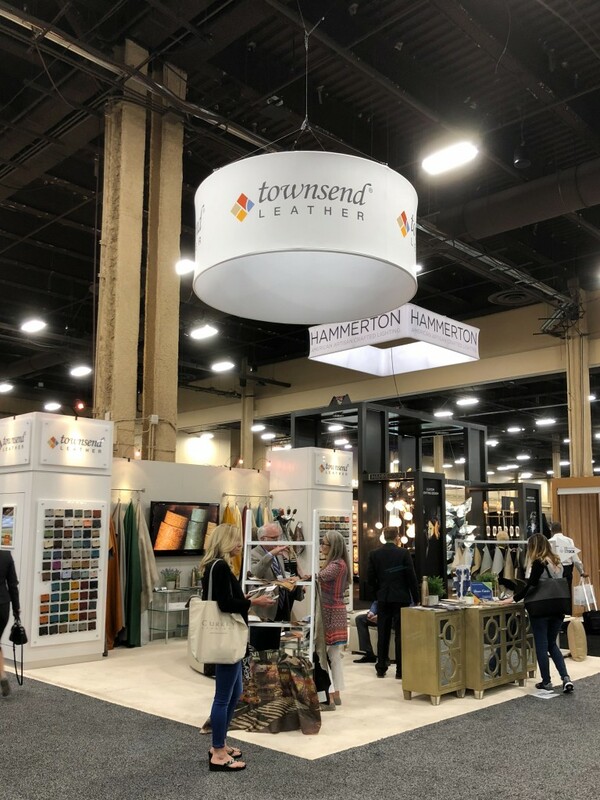 Townsend Leather ‘s booth always attracts a faithful following. 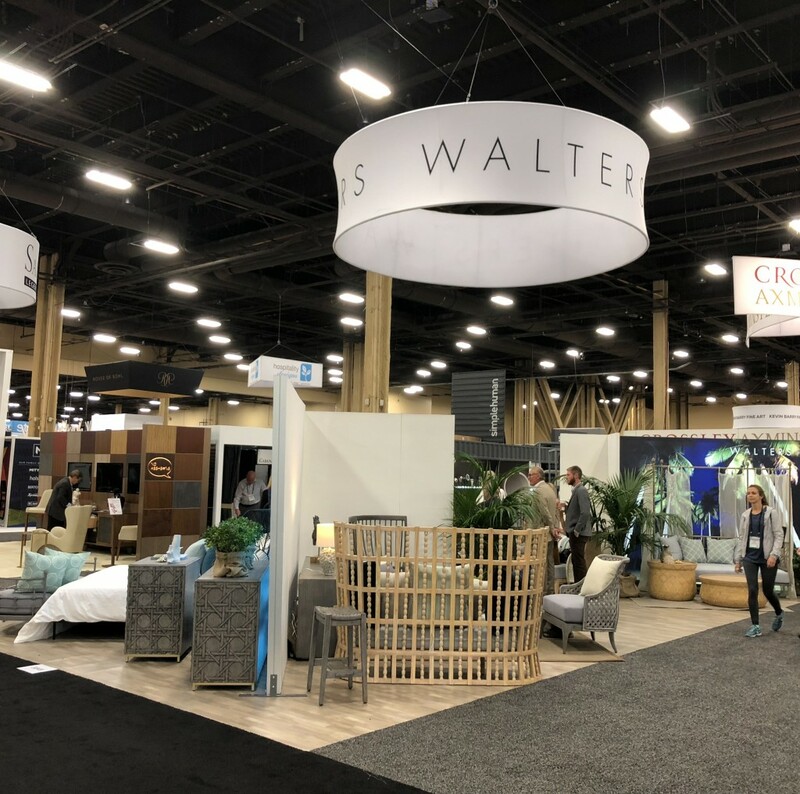 Walters features a range of its exceptionally well-crafted wares. 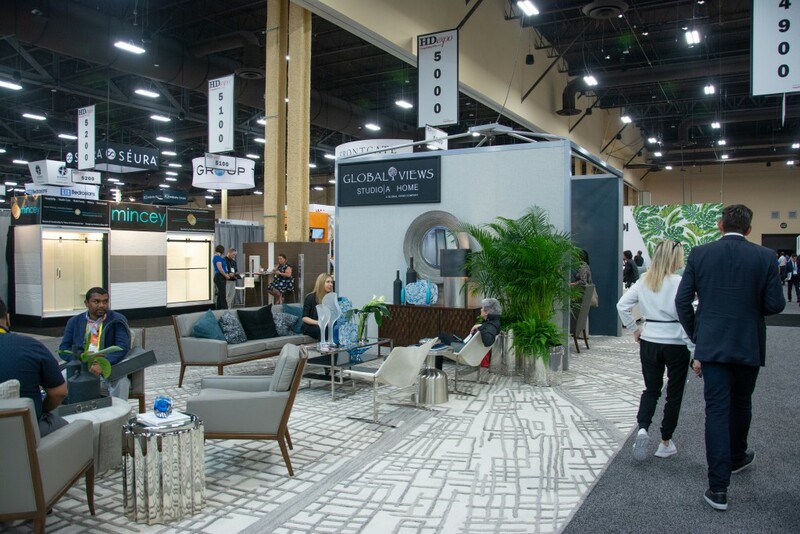 For finishing touches it’s hard to surpass the range at Global Views Studio A|Home. 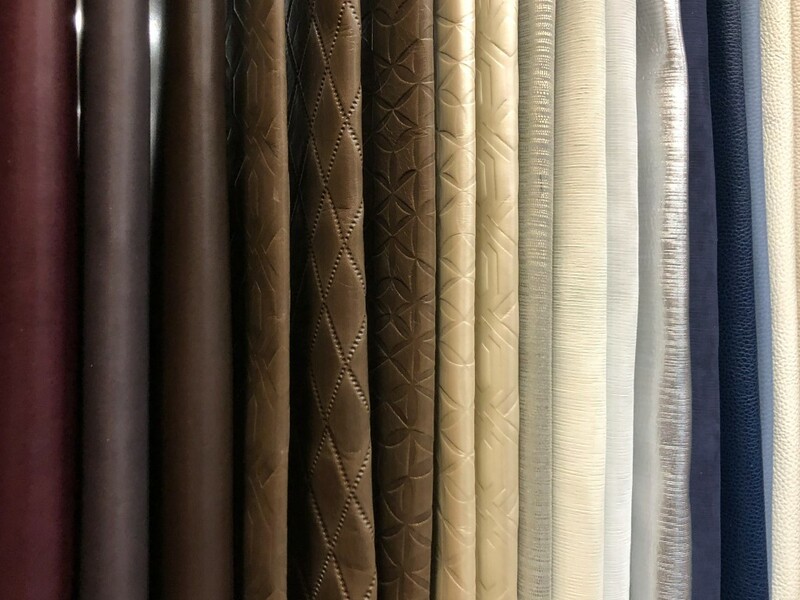 More on offer from Studio|A.